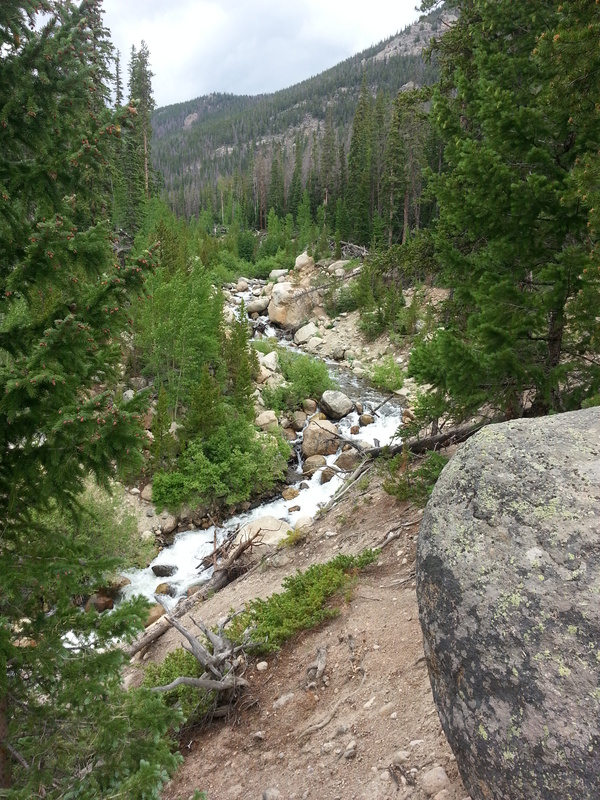 This past Sunday, Gene and I hiked to Lawn Lake in the Rocky Mountain National Park. 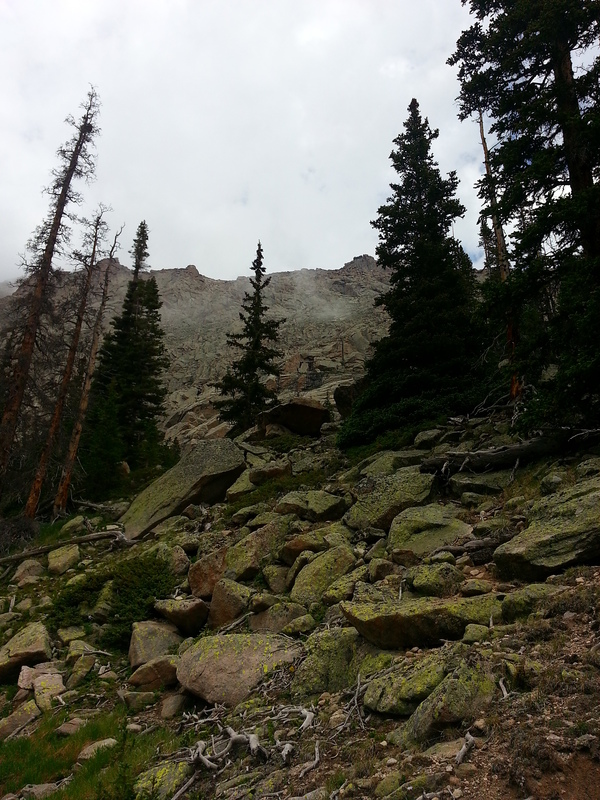 It’s a hike on the Estes Park side. The lake is 6.4 miles from the trail head. We left our apartment at 9 am and started hiking at 11 am. The trail was mostly uphill getting to the lake but overall we kept a decent pace. In general, Gene and I hike a little over 2 miles an hour. It’s a very rocky trail so at times the going is slow when one has to pick his way through the path. We did get rained on going up, but only for a little bit, and we had brought ponchos so it wasn’t that rough. 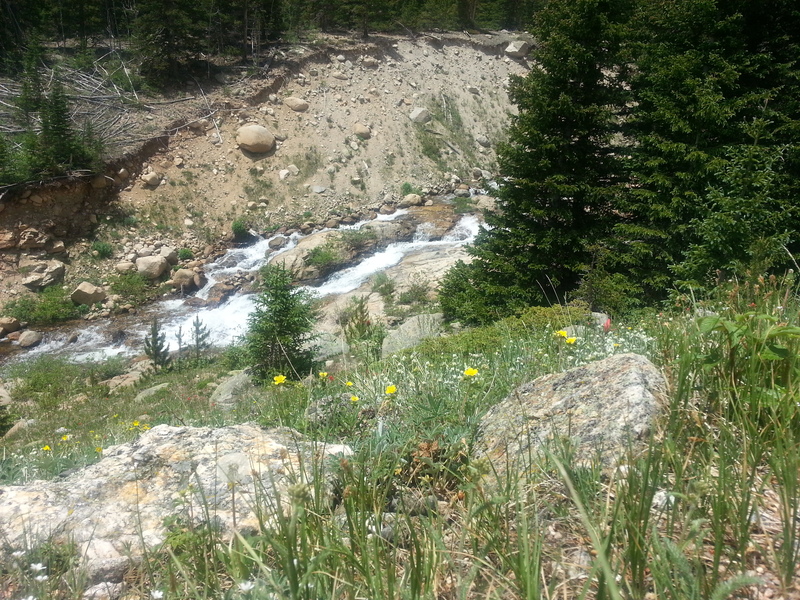 The trail loosely follows the path of the alluvial fan. One catches glimpses of that path throughout the hike, but in general there are trees blocking that view. There were a lot of pretty wild flowers and aspen trees. Even though most of the day was cloudy, there were plenty of beautiful sights. We saw many types of wildlife too: a few marmots, chipmunks, and rabbits! It took us three hours to get to the lake and there were a lot of times where I falsely exclaimed, “The lake is over there! I just know it!” but we did make it. It started hailing on us right as we got to the lake, but we waited it out and found a decently dry spot to eat our lunch. Gene mentioned at one point how he had never seen any wild rabbits up in the mountains before, and I had agreed. What would you know, not even 10 minutes later did we see 4 or 5 rabbits running around. They were so beautiful. They were large, had long, gorgeous ears, and huge, white back legs. A couple of times one of them came really close to us. They were way too fast for me to get a picture. The lake was absolutely stunning. I was so ecstatic that we made it that I was giddy and going a bit crazy about how beautiful the place was. It might be one of the most beautiful places I’ve been too. After lunch we headed back down. It took us another three hours. Going back was actually worse for my knees because it was mostly downhill. I’m pretty set on finding some of those hiking sticks now to help ease the pain. I stopped every so often and did some knee exercises, which helped, but it was still a bit tough. I also need to work on being lighter on my feet when going downhill. It’s a work in progress. Gene and I will definitely do this hike again. We’d like to hike up to the lake, camp there, and then the next day hike a bit farther to another lake and hike back down. This place is so gorgeous and there weren’t that many people on it. Although it is a slightly tough hike, it is worth it. I loved the views, I loved getting away from traffic, I loved being outdoors. So put Lawn Lake on your list of hikes and I’ll see you up there! Welcome! There are so many hikes in Colorado, all across the state. I moved here about a year ago and I still have so much to see and do. That’s what I love about this state, there’s always something new to experience! Looks like a great hike – love the pics.